(PhysOrg.com) -- A new study of wolves (Canis lupus) has found that communication between pack members and a social hierarchy are not essential features of a successful hunt, and all the wolves have to do is follow two simple rules. The researchers, led by Cristina Muro of the Assistance Dogs Association AEPA-Euskadi, in Bilbao, Spain and colleagues in Spain and the US, used computational simulations to study the strategies of wolf packs in hunting and capturing prey. The results of the study were that two simple rules were sufficient to reproduce the actual wolf-pack behaviour of tracking, pursuing and encircling prey seen in the wild. The rules were, firstly, move towards the prey until at a close but safe distance (the distance depending on factors such as the length of horns), and then secondly, when at the minimum safe distance, to move away from the other wolves which are also in position. The only information each of the five wolves in the computer-simulated pack needed was the position of the other wolves in the pack, and it did not necessarily need to communicate with the other members. The computer models also found that no hierarchy was required within the pack for the hunting to be successful. The results suggest that theories requiring the wolves to display a strict hierarchy along with superior intelligence and ability to plan the chase may be off the mark, since simply following the two rules resulted in the virtual wolves in the computer simulation behaving remarkably like wild wolf packs. The virtual wolves closed in and encircled the prey in the same way as real wolves, and if the prey tried to escape one wolf would sometimes seem to ambush the prey after it drew back to maintain distance from the other members of the pack, which placed it in the path of the prey animal. The results of the study do not prove, however, that wolves are not intelligent and do not show foresight or planning. 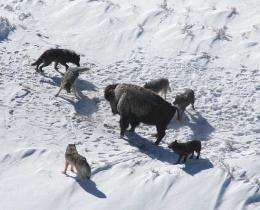 Research at Yellowstone Park reported on last month at Physorg also demonstrated that wolves are risk-averse and keep at a safe distance if they can, leaving other members of the pack to do the dangerous work of getting in closer to prey, which can kick or gore them to death. This research also showed that smaller wolf packs can hunt more effectively than larger packs. The results of the two studies raise questions about why wolves tend to live in packs, since the previously held assumptions of a large pack being more effective at hunting, and social behaviour and communication being essential, appear to be wrong. We have produced computational simulations of multi-agent systems in which wolf agents chase prey agents. We show that two simple decentralized rules controlling the movement of each wolf are enough to reproduce the main features of the wolf-pack hunting behavior: tracking the prey, carrying out the pursuit, and encircling the prey until it stops moving. The rules are (1) move towards the prey until a minimum safe distance to the prey is reached, and (2) when close enough to the prey, move away from the other wolves that are close to the safe distance to the prey. The hunting agents are autonomous, interchangeable and indistinguishable; the only information each agent needs is the position of the other agents. Our results suggest that wolf-pack hunting is an emergent collective behavior which does not necessarily rely on the presence of effective communication between the individuals participating in the hunt, and that no hierarchy is needed in the group to achieve the task properly. Pack size shouldn't be the determining factor. Expected gain per wolf (i.e. amount of food per wolf per unit of time) should be the determining factor. Increased pack size will increase the chance of a successfull hunt while decreased pack size will increase the amount of food per wolf per kill. This in turn needs to be balanced with availability of prey animals. 2) Number of hunts is low (which favors a small pack). Optimum in this 'scarcity' case may be either a large pack or a lone wolf. If prey animals are plentiful then - even though a smaller number of wolves can amass enough food with only a moderate amount of efficiency - a more successfull pack can sustain larger numbers. yeah, its pretty obvious....how could the author of the study miss that?its obvious working in a group/pack makes it easier to run down and surround and catch prey. also where was it shown a large pack was less effective? social interaction and communication might not be as important as we thought but that in no way proves a large hunting group is less effective than a small one. very well said. i was going to touch on the ideal number depending on the situation but im lazy. no doubt our military is too damn stupid to be looking at research like this and extracting obvious strategies of behavior for programming drones. nice rant about the military, how precisely would this help drone attacka though? ya know what? dont bother answering that.